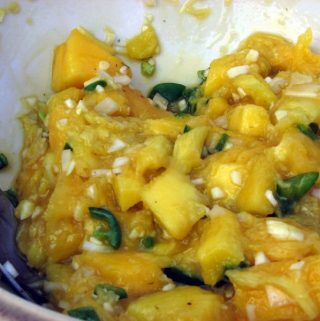 If you don’t already know how I feel about Kent mangoes, check it out here. That out of the way, keep reading!! If you happen to be perusing this post in February or March, then GREAT because I’m here to tell you to keep your eyes open at the market because Kents are starting to show up and naturally Whole Foods is on top of the mango opportunity. And not that this post is about organics, BUT one thing I like about Whole Foods is for some reason, they do the best job of stocking organic mangoes of any market. Once in a blue moon, I’ll see them at Trader Joe’s, but Whole Foods, bless its exorbitantly expensive heart, often stocks organic mangoes. And sometimes, I’ll even see Organic Fair Trade mangoes there. Most recently, I saw a beautiful batch of Organic Fair Trade Kents at Whole Foods and was really pleased with the quality. Another time I found some Fair Trade Haitian mangoes, which thrilled me so much, I wrote a whole post about it. 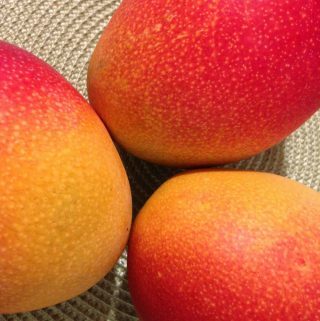 Anyway, late winter, early spring is when the mango run here in the non-tropical states of the USA begins. Start your engines, folks. We have mango liftoff!